Honda’s upmarket goals might not have been fully achieved with the Accord, but it does occupy a desirable middle-ground between mainstream drudgery and premium desirability. A fine-driving, well equipped and certain to be reliable choice for those canny used car buyers who dare to be a bit different. Bigger, more prestigious and more refined than the previous Accord, Honda’s upmarket goals were obvious when the current model was introduced in 2009. Unlike mainstream rivals there’s no hatchback, the Accord deliberately only offered in saloon to distance it from its mainstream rivals. It’s been successful to a degree, as, although not quite able to match the cachet of German models, the Accord feels a bit more special than competition from Ford, Opel and Toyota. Trim and engine choices are relatively few, though that’s good news for used buyers as it’s relatively simple to work out what you’re getting. Even the entry-level ES cars come with reasonable amounts of equipment - such as dual-zone automatic climate control, alloy wheels and cruise control among the standard specification. Above the ES trim Type-S models make more desirable buys, not least thanks to more sporting styling and even more generous standard equipment. Executive models add larger alloy wheels, a sunroof and other luxury equipment such as satnav and leather, which explains why they're the biggest sellers in the line-up. Engines include a 2.0-litre petrol and 2.2-litre turbodiesel choice, the latter the more common - its popularity meaning that it’s the only engine Honda offers the Accord with now in either 150- or 180hp outputs. The standard transmission is a six-speed manual, though there’s the option of a five-speed automatic. Though the automatic models are relatively rare on the used market, at about 10 per cent of sales there should be more of them about than similarly priced rivals. 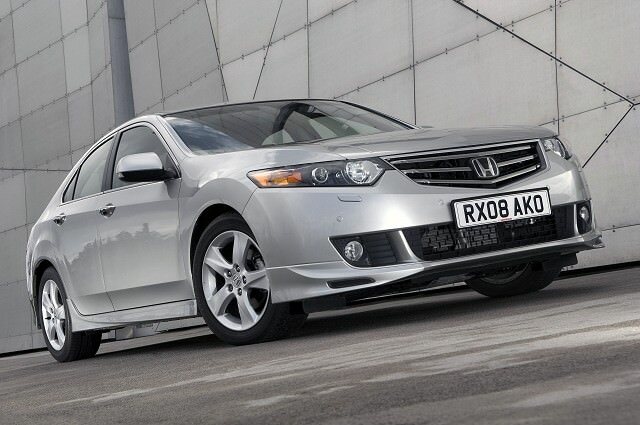 Fit and finish is good, and Honda’s reputation for reliability makes the Accord a sensible and desirable used buy. There are some petrol 2.0-litre models on the used market, but far more desirable (and plentiful) are the 2.2-litre turbodiesels. Badged i-DTEC, Honda’s first attempt at a diesel engine combines excellent economy with fine refinement and performance. None of the trim levels will leave you wanting for equipment, but Type-S comes with not just ample specification, but more sporting looks with revised front and rear bumpers and side body trim. It’s the pick of the used buys.